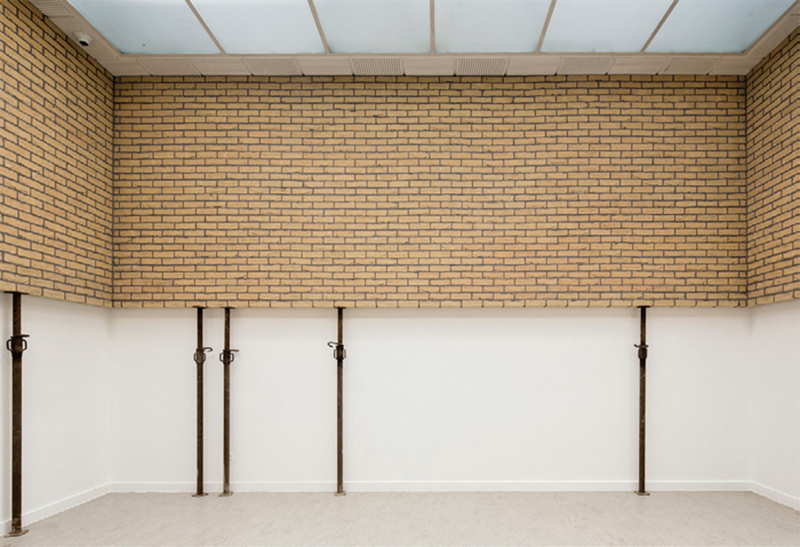 Leon Vranken, Horizon, 2014, bricks, cement, steel struts, 9' 2 1/2“ × 26' 4” × 16' 5". “Paper-Scissors-Stone,” the most recent show by Belgian artist Leon Vranken, got off to a powerful start with Flowing Line, 2014, a jet of water noisily shooting out of a circular pit cut into the floor, enclosed by a white railing. As with Study of a Vertical Line, 2013the thirty-six-foot-high fountain and ascendable scaffolding structure that the artist erected at the Middelheim Musuem, an open-air sculpture park, in Antwerp, Belgium, last yearvisitors could experience the top of the water jet, here by moving up one floor within the building. The fountain spouted right through a neat hole in the ground-floor ceiling, emerging upstairs as a modest squirt of water, once again encircled by a white railing. With the exception of the fountain, Vranken left the ground floor distinctly empty; he had stripped the spaces and returned the architecture to its bare state.